It’s suddenly turned bitterly cold here in the Lincolnshire Wolds as winter truly sets in. I love this kind of weather. A really bright low-sun and the countryside covered in a glistening frost. It’s stunning and feels like it’s finally cold enough to kill some of the nasty bugs that have been going around in the vile mild temperatures we’ve been experiencing. The only downside is that the cottage is so cold that it takes almost all the weekend to get the place nice and cosy that by the time we leave on Monday to go back to London it’s perfectly toasty and very hard to actually leave… which is why cooking all weekend on a hot stove is the only way to deal with it! So this is one of my favourite winter warmer dishes, it’s full of delicious vegetables, fresh herbs and broad beans but i’ve also pan-fried some mini portobello mushrooms along with the vegan sausages to add a more earthy vibe. 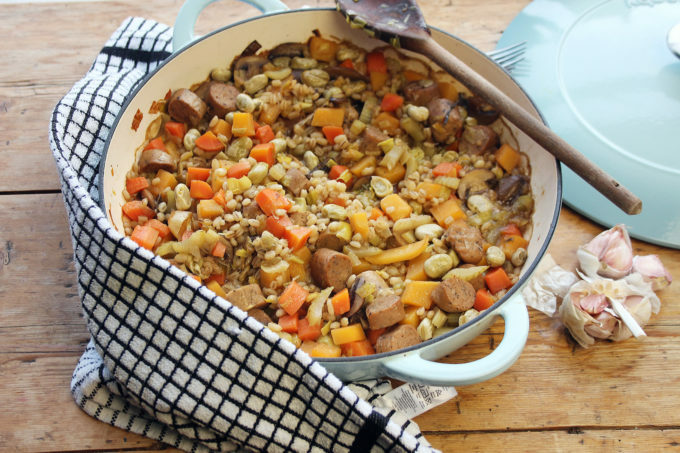 It has a rich white wine gravy which brings all the ingredients together and i’ve thrown in a handful of pearl barley which are busy soaking up all the flavours nicely. Dishes like this are so great because not only are they packed full of taste but they’re so easy to throw together, it’s literally seconds on the hob and then a wonderful slow cook for an hour or so and you’re done. I always find with dishes like this that you should allow them to go cold and re-heat them before eating. Sure, they’re fine the first time around but there’s something about that temperature change and reheat process that seems to add more flavour. So with this in mind I tend to make dishes like this in the morning of the day I want to eat them so not only will they taste divine by the time we eat them but they also fill the whole house with the glorious aroma of slow-cooking. stir in the broad beans, pearl barley and then the stock and wine, turn the heat down to it’s very lowest, place the lid back on and let it gently plop away for at least an hour, if not longer. 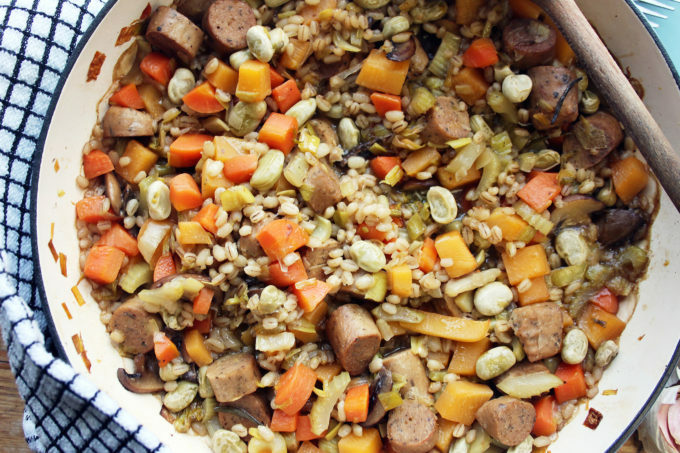 I like the easiness of this and although yours is a vegetarian one it would work with other sausages and different veg as well. 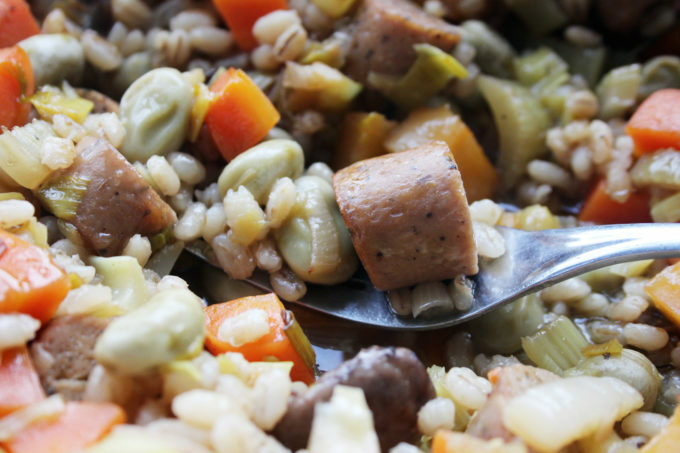 We have been using turkey sausages for stews lately. They’re a bit bland unless you stew them, then they take on all the flavours in the pot. It looks so delicious! Using the meat vegan sausages is also an option, isn’t it? I hope my question is not too offensive! Very informative & useful post. It really helped me. I was checking constantly this blog and I am impressed! Thank you and good luck…….